Theme park historians or parkeologists who remember a certain period within the parks (and we know that memory is entirely subjective, but it just simply doesn’t apply to us in that moment) can often be caught ogling an old photograph in a book or staring at a shuttered building. In the Magic Kingdom two big spots for this history gazing tend to be the Adventureland Veranda, currently occupied by Tinker Bell and her associates, and the Diamond Horseshoe. Today, I want to look at the latter, or rather the latter’s menu. During the recently heavy Spring Break period, the Magic Kingdom has been utilizing the Diamond Horseshoe as a temporary lunch location. The tinny melodies of a self-playing piano waft from the stage and the elegance of the dance hall go, mostly, unnoticed by the guests. The menu includes a pork sandwich, two types of turkey sandwiches, a tuna sandwich, a Portobello sandwich, and two salad offerings. 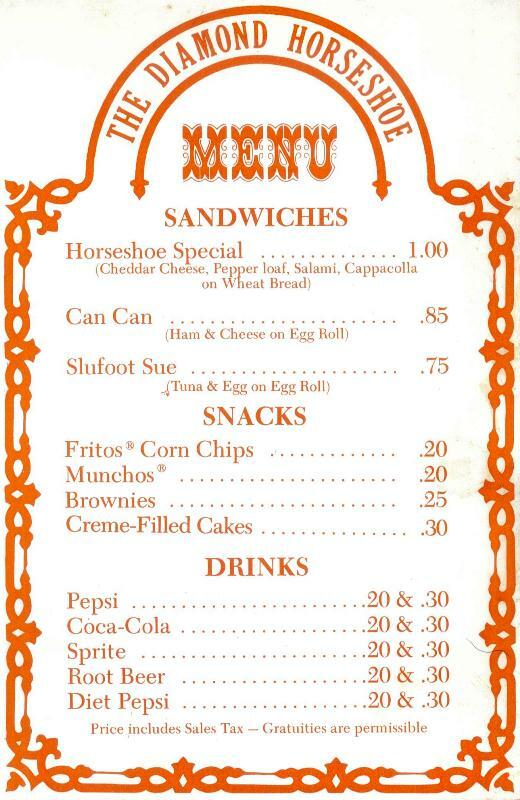 While this may not seem like a particularly inspired menu, let’s take a gander at the Horseshoe’s bill of fare from the 1970’s. Hmm… a ham and cheese, tuna and egg, a deli sandwich, and a few snacks. Oh, and yes I did notice the misspelling of Slue Foot Sue as Slufoot Sue. The choices were listed on a little triangle card that was placed in the middle of the table and was viewable, or movable, by dining guests. Do we see those soda prices? Oh, and note that both Pepsi and Coke were offered. However, chewing over the offerings, this menu isn’t setting any stomachs a quiver either, is it? The Diamond Horseshoe has never been about food, its legacy is in its ambiance and its Revue. While the Revue may not be stomping across the stage or setting any hearts a flutter in this day and age, there is still a lot to be enjoyed at the Diamond Horseshoe when its doors are flung open. 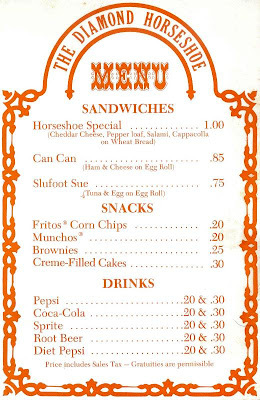 As for me, I’m thinking about heading out to my local deli and putting my own personal spin on the Horseshoe Special!